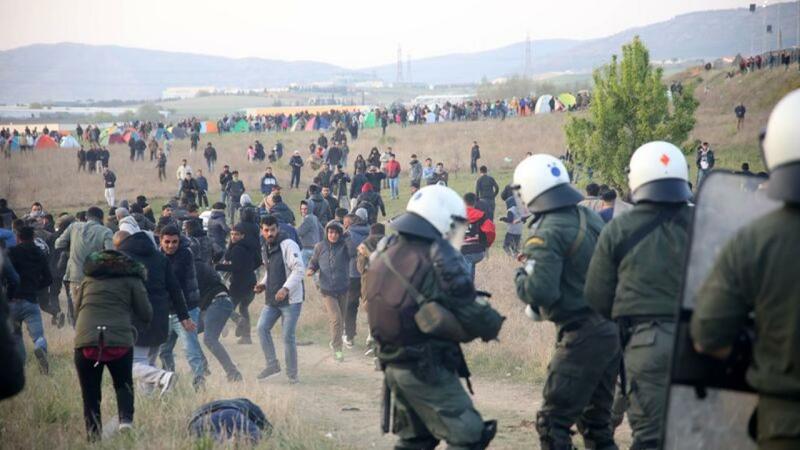 Greek authorities fear a "new Eidomeni"
Cause for much concern for the Greek authorities have been the incidents that have been taking place since yesterday, with protagonists refugees and immigrants demanding to be allowed to go from Edomeni to Gevgeli of North Macedonia, so that they can then continue their course to Europe. Athens speaks of “misinformation” through social media by traffickers and groups with “strange” interests. More specifically, yesterday, more than 500 refugees and migrants gathered outside the Diavata camp north of Thessaloniki and attempted to move to the Edomeni area, which used to be the most frequent passage from Greece to North Macedonia and from there to the rest of Europe. However, this is no longer the case, especially after the EU-Turkey declaration and the closure of the border. The police forces did not allow them to take the road to Edomeni, resulting in tension, with the migrants throwing stones and the police making use of chemicals. Clashes also took place outside the camp today. At the same time, since early Friday, refugees and migrants have seized the Central Railroad Station with a request to go to Diavata and from there to Edomeni. Strong police forces are on the alert and train schedules have been canceled. “The borders are and will remain closed and it goes without saying that we will not allow irregular movements”, said the Minister for Immigration Policy and called on all those outside the Diavata camp, including many families with children, “not to endanger themselves, their family and the other people who are around them”. The minister of civil protection was also very clear on the subject, saying they will not be allowed to leave Diavata, the border to another country will not open and they will not be allowed to move to Northern Greece from the Athens railway station. According to an Iraqi refugee who has spoken to IBNA, for two months there have been messages on social media, stating that the border will open, while last week an appointment was given to the Diavata camp to launch the “Caravan of the Hope”. For this reason, the Ministry of Migration Policy and the UN High Commissioner for Refugees are trying to convince refugees and immigrants in camps, with six-language announcements, not to risk their security by attempting illegal border crossings. It is also stressed that their departure from the camps may have the effect of not being accepted if they return to them.